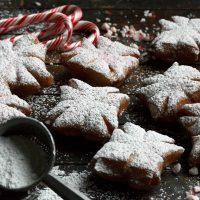 Adapted from a Dominique Ansel recipe, these little sweet treats are fun, festive and delicious! Can be made ahead and/or frozen. In a medium bowl combine the milk, warm water and yeast. Let stand for 5 minutes. In a stand mixer fitted with a dough hook, combine the sugar, salt, egg, butter and flour. With the mixer on low speed, pour in one third of the milk mixture. Allow the dough to come together completely before adding the next third of the milk mixture. Mix on medium speed for 3 minutes, then slowly add in the last third of the milk mixture. Turn the mixer up to medium-high speed and mix for 5-7 minutes, until the dough pulls away from the sides of the bowl, adding a bit more flour, as necessary. Remove the bowl from the stand mixer and cover with plastic wrap. Allow the dough to rise at room temperature for 1 hour, until about doubled in size. Punch down the dough, cover the bowl with plastic wrap and refrigerate for at least 2 hours. Remove the bowl from the fridge and turn out the dough onto a heavily floured work surface. Using a rolling pin, roll out the dough into a 8x12-inch rectangle and about 3/4-1 inch thick. Cut the dough into 2-inch squares, to give you 24 squares. To make snowflakes: With a 2-inch square in front of you, cut 1 inch in from each corner towards the centre, then make four more cuts one each side of the square. *Tip: dipping the end of your knife in flour in between every couple of cuts helps keep the slices from joining back together. You can also dip your fingers in the flour if you find they're sticking to the dough as you work. These can be fried right away or stored in the fridge on a tray and tightly covered in plastic wrap for up to 24 hours. In a deep fryer, heat the oil to 375F. In batches, gently lower the dough squares into the oil, using heatproof tongs or a slotted spoon to turn them regularly as they fry, until golden brown. Remove from the oil and drain on a cooling rack or paper towels. Dust generously with lots of icing sugar and crushed candy canes, and enjoy while they’re still warm.